If you want to burn fat fast in minimum time, ditch the cardio and interval training. These complexes only take a few minutes and can be plugged after any workout or when you don’t have time to waste and need to blow-torch calories on a busy schedule. You’ll discover how to train like an athlete using a variety of complexes including ladders and density circuits. 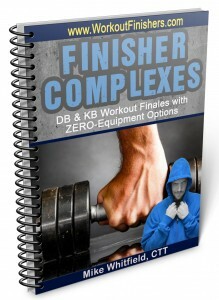 Each finisher comes with ZERO equipment options, too so you can dismiss ALL excuses. If you don’t get the results you’re looking for AND have fun with these, I don’t want your money…. PERIOD. So give these finishers a full test drive for 60 days and if you don’t like them for any reason, I’ll refund your investment with no questions asked. PS – It’s time you kick cardio to the curb and get out of your comfort zone with these new complexes (including zero equipment options).